Britannica School is an online learning resource that is trusted by millions of teachers and pupils across the globe. For children learning English as a second language, Britannica School provides a wealth of resources on language, grammar and pronunciation. Our ESL materials can play a central role in helping children improve their English. With access available at school, at home and on the move, teachers and parents can seamlessly support children as they learn. 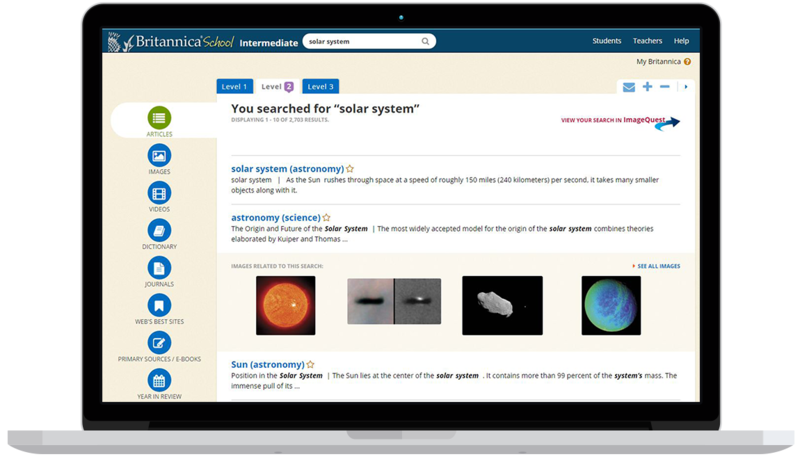 Our series of subject and topic specific websites, Britannica® Spotlights, bundle together citable articles, digital resources and lesson plans to help teachers deliver effective lessons. Teachers can embed videos or print images with the click of a button, giving them the flexibility to use the resources however and wherever they need to use them. Whatever age the child, Britannica School has appropriate teaching and learning resources to help them develop and learn. We encourage confidence in discovery by creating resources that make learning fun for younger children. For older students there is more challenging content and “how to” guides that help students prepare large projects and presentations. All of these resources are available in a safe environment where children can explore a wide range of balanced, professionally edited, subject related material. How can I download more information? How does Britannica School relate to my curriculum? How does Britannica School support pupils/parents for whom English is an additional language? Who has access to Britannica School? Who are the editors and authors of the content? How often are the services updated? Can I copy or reuse content in my own work? How can we integrate Britannica School? How will the Britannica team support my subscription? Who are the editors and authors of the content? Britannica has a complement of over 100 full-time editors and more than 4,000 contributors, who are experts in their respective fields worldwide. Notable contributors include Albert Einstein, Desmond Tutu, Tony Hawk and Eleanor Roosevelt. How often are the services updated? Britannica School is updated daily and over 120,000 articles are reviewed and revised each year. Access to Britannica School does not require individual login IDs or passwords. There are a range of authentication options. We work with most LMS and VLE systems and also provide access through IP authentication and URL referral. Britannica will work with your school to provide remote access, helping to promote parental engagement. For further technical support, please contact Britannica on +44 (0)20 7500 7800. This service is available Monday through Friday from 9am to 5pm UK time.